The remainder of the history will have to consist of obituaries and excerpts from sketches already published. This necessity requires an explanation, which can be made now most opportunely, and which, though the author is very reluctant to intrude in such a manner, is best presented in the first person. I began this work early in 1931, at least a year before my transfer from St. Michael's. At the time the pastor, Rev. James J. Wilson, was ill in a hospital and his condition was so alarming that there was little likelihood of his ever resuming his duties. The men of the St. Vincent de Paul Society at one of the Monday evening meetings, at which it was the custom to talk informally of parochial affairs after the completion of business, broached the subject of a centennial celebration, which they thought should be held as soon as possible since the Constitution of the parish gave as the date of incorporation April 5, 1831, and they very earnestly expressed the hope that in connection with the event there would be published a carefully prepared and detailed volume of parish history. I was greatly impressed by their desire for such an account, and readily understood that without it any observance of the centenary would be incomplete. Later the realization came that the writing of a detailed history could scarcely be accomplished within a year, unless one could devote oneself to it entirely, which obviously would be impossible for a priest, and that it was not unlikely in view of Father Wilson's serious illness the task would suddenly be thrust upon me as senior assistant. In a precautious spirit then I applied myself to reading whatever pertinent matter was at hand. This consisted of a souvenir book of the financial campaign of 1920, Monsignor Kirlin's "Catholicity in Philadelphia", Daniel Mahony's "Historical Sketches of the Catholic Churches and Institutions of Philadelphia", the records of the meetings of the Board of Trustees, and the various registers. It was interesting work from the very beginning. I bought several volumes of history, and took to making researches in libraries, that of the Historical Society of Pennsylvania, of the American Catholic Historical Society, and the Ridgeway, and to deciphering the inscriptions on tombstones and communing with the dead in the old graveyard, where it seemed to me one could best conjure up the scenes of bygone days. My interest became almost passionately intense and the writing of the centennial narrative my dearest wish, for I had found something more than the usual record of a parish's foundation and gradual development. I had gotten a glimpse of an epic struggle. Father Wilson, somewhat improved in health, returned to the rectory, and several times spoke vaguely of holding the celebration. On hearing of my historical efforts he informed me that he intended to do this work himself. But this declaration was certainly to be discounted, for his physical condition was such as to render it impossible for him to devote himself to anything so trying, and after a moment's bitter disappointment I decided to carry on quietly, hoping that ultimately my narrative would be requested. My plan called for twelve chapters, of which the first would be a prologue giving a clue to the meaning of the whole story, the second would fit the establishment of the parish into the development of Kensington and of the City, the next six would cover the first thirty years, then three on the other seventy, and finally a sort of epilogue on the old graveyard. This may seem a disproportioned arrangement, but it was justified by the varied nature of events. Besides, my purpose was not merely to present the facts in proper order, but also to tell the tale of a glorious victory achieved through Christian fortitude and perseverance. Hence the early years of suffering and sacrifice assumed a greater importance, and particularly the riots and the railroad disaster, in which the faith of the parishioners was most severely tested, merited lengthy treatment. It seemed to me that an historical account of this type would have a wide appeal. In April, 1932, the first six chapters had been finished and all the material assembled necessary for the completion of two more. There was apparently no need for hurry for now no reference was ever made to the centenary. But at the end of the month a letter came from His Eminence transferring me to St. Ambrose's on the Roosevelt Boulevard. My manuscripts and notes were laid away in much the same spirit as one would bury the corpse of a beloved friend. For two years they remained untouched, and after a while I had even forced myself to cease thinking of them. Then suddenly about a month ago I found that my history was wanted after all. Rev. Patrick H. McGinnis, the energetic new rector of St. Michael's, having determined to observe the centenary in the fall, and wishing to issue such a volume at the same time, graciously asked for the account I had prepared. But it was obviously impossible to complete it properly; the process of publishing the book would require at least three months. Rather than make a poor attempt at covering the last seventy years in some fashion, I decided it was best merely to use the summaries and sketches available. It is with the greatest regret that I shall see the work of the curates who served during this time passed over in silence for some of them because of their extraordinary zeal and length of service deserve special consideration: for example, to mention only a few who are well remembered today in the parish. Rev. John F. O'Neill, now rector of St. Elizabeth's; Rev. Joseph A. Murphy, rector of St. Rose of Lima's, North Wales; Rev. William L. Hayward, rector of St. Alice's, Stonehurst; Rev. James J. Rice, rector of St. Matthew's in the Mayfair section of the City; and Rev. John A. Godfrey, J.C.D., now curate out at St. Carthage's. No doubt Father McGinnis with his worthy assistants: Revs. George J. Mullan, Peter A. Daley and Raymond J. O'Donnell, will prepare an appendix which will contain a list of all the curates and various other data such as the names of those who left St. Michael's to enter the priesthood or religion, and outlines of the history of parochial societies. Before adducing the excerpts and obituaries I wish to make a remark or two about the later development, based on the few notes concerning this period that were to be found among my papers. Since the tragedy at Dewey's Lane the parish has never been afflicted. Blessings have come down copiously upon it from a God Who, to speak with reverent anthropomorphism, seems to have been satisfied that its faith was strong and fervent enough to pass any test whatever. Its people have, of course, shared in the common tribulations of the City and the Nation; they suffered undoubtedly in the various periods of economic depression, and experienced the anxieties, fears, sorrows of our wars - many of them laid down their lives on the field of battle. Every family, too, must have had its own particular trials. But parochial life has ever since gone on smoothly and tranquilly. There has been great growth and much prosperity. There has been building and enlarging and beautifying. The School has had an enviable record; societies have nourished which were the admiration of the whole diocese; the parish has received signal honors. St. Michael's became rather famed as a Catholic unit of extraordinary strength and piety. Such has been the fruit of the indomitable zeal of the founders, such the victory of their faith. Even when the inevitable ebb set in the fortune of lower Kensington, the parish declined very gently, almost imperceptibly. It ranks even today as one of considerable importance, and the spirit of devotion pervading it is unsurpassed anywhere. Father Kieran left St. Michael's in the autumn of 1864. Since then five pastorates have run their course: that of Very Rev. Maurice A. Walsh, LL.D., V.G. ; that of Very Rev. Charles P. O'Connor, D. D.; of Rt. Rev. Msgr. James J. Fitzmaurice; of Rev. Hugh J. Dugan; and that of Rev. James J. Wilson. Father Walsh, a man of exceptionally forceful personality, came to St. Michael's from the Seminary of St. Charles Borromeo where he had been rector three years and had shown most efficient management. It is an interesting fact that he had been ordained in this church along with a Rev. David J. Whelan on July 8, 1855, by Bishop Neumann. He immediately became enthusiastic about the plans already made for improving the edifice, and had this great work done in 1865 under the direction of Architect Durang. The following year, September 30, St. Michael's Church was consecrated by Bishop Wood in the presence of forty-three priests and a vast gathering of the laity. The sermon on the occasion was preached by Rev. Jeremiah F. Shanahan, then rector of the preparatory seminary at Glen Riddle, and later the first Bishop of Harrisburg. It was during Father Walsh's tenure that the Board of Trustees began its decline to the condition of being a merely nominal institution in the management of the temporalities. It had always functioned excellently; the lay members had always given perfect cooperation to the Reverend President. But the ecclesiastical authorities looked with disfavor on any measure of lay control, and the new rector seems to have had in mind to weaken its position gradually. We find him again and again merely informing the Board of action he had taken independently: for example, he had made changes in the choir, had added to the teaching staff of the school, and had had the basement frescoed, had spent $3,000.00 during the summer vacation in renovating the sister's house. As time went on the meetings became more and more infrequent. The parish developed admirably under his care of its spiritual and temporal welfare. In 1868 a third curate was necessitated by the increased work. The Academy was greatly improved and a new house built for the brothers. Father Walsh was appointed vicar general during his service at St. Michael's. In 1877 he accompanied Archbishop Wood on his journey to Rome for the celebration of the fiftieth anniversary of Pope Pius IX's consecration as Bishop. Two years later he was transferred to St. Paul's, where after having given many more proofs of his ability and zeal he died November 22, 1888. Father O'Connor who succeeded him at St. Michael's in 1879, although then only thirty nine years of age, had already had a distinguished career. He had gone from Philadelphia - St. Mary's was the parish of his birth - to pursue his theological studies at Rome, and had been ordained there September 8, 1866. He had been vice rector of the American College in the Eternal City, vice rector and then rector of St. Charles' Seminary. At the suggestion of Archbishop Wood the Holy Father had conferred on him the title of doctor of divinity. On assuming the duties of the pastorate he was surprised to discover that the parish was in debt to the extent of $20,000. His predecessor apparently had not been disturbed by this condition, expecting perhaps to remedy it by a special appeal at an opportune time. But Father O'Connor wished to rid himself of the burden as quickly as possible, and forthwith issued a financial statement and asked for the generous cooperation of his people. The block collection taken up in the weeks following amounted to $3,781.35, but the fair held in April, 1880, brought the incredible sum of $12,122.70. The response of the parishioners pleased him exceedingly; he was soon able to settle the debt and ready to plunge anew if it should be necessary. In 1886 he borrowed $10,000 from the Beneficial Saving Fund Society, in order to make extensive repairs and other improvements in the church. The Diocesan Synod held that year selected in accordance with the prescriptions of the Third Plenary Council of Baltimore ten parishes of the City and two of the county districts for the distinction of the permanent rectorship, which along with other advantages gave the occupant the right to vote in the nominating of a successor to the See, and St. Michael's was one of those so honored. The census taken at the time of the block collection just referred to showed that there were 7,604 parishioners, of which number 2700 were children under fifteen years of age. The territory had been diminished further by the establishment of St. Edward's in 1865, the Immaculate Conception in 1869, Our Lady of the Visitation in 1872, but what was left was now quite thickly populated by Catholics. The Germans, too, had another church in the neighborhood - St. Bonifacius'. In regard to Father O'Connor's spiritual activities on behalf of his people – the more important consideration, but at the same time one about which it is difficult for an historian to discover precise data - it is recorded that he was most zealous m preaching the Word of God, delivering, for example, without aid the sermons of Advent, Lent and the Forty Hours. He passed away May 29, 1887. Archbishop Ryan after the prescribed examination chose a member of a family already very prominent in the Church in Philadelphia to fill the vacancy. Rev. James J. Fitzmaurice, ordained m the Cathedral May 10, 1866, by Bishop Wood. He was called from the pastorate of the Sacred Heart Church where during the eleven years of his administration he had made a splendid record. At St. Michael’s he built a pastoral residence and a school house. The latter work necessitated the demolition of the old rectory 1425 N. Second Street and the priests resided temporarily at 1414 N. Second Street. Eight years later that is in 1900 he so renovated the entire exterior of the church that it had the appearance of a new edifice. He founded St. Michael's Literary Institute, giving the society the use of the house at 1437 N. Philip Street, in which the Christian Brothers had conducted classes for boys during the erection of the school. The institute has developed into one of the best known parochial organizations for young men in the diocese. Its first spiritual director was Rev. James J. Carroll, later Bishop of Nueva Segovia in the Philippines; the others have been Revs. James A. Hogan, John F. 0 Neill, Edward J. Rahilly, T. F. Kelly, William L. Hayward, John A. Godfrey, J.C.D., James J. Rice; at present, Rev. Peter A. Daley holds the office. To quote now from Kirlin's "Catholicity in Philadelphia": "The years of Father Fitzmaurice's administration were marked with an activity perpetuated in the improvements of the parish and in the new buildings which make St. Michael's one of the most complete and best-equipped parishes in the City. The old residence and parish school were torn down, and the present magnificent schoolhouse erected south of the church. On the comer of Second and Jefferson Street, adjoining the church on the north a new pastoral residence was built. This work was finished in 1892. Father Fitzmaurice added a new facade to the church building and new sacristies. Complete renovation of the interior and decorations in the best taste put old St. Michael's Church in rank with the best in the Diocese. In the year 1905 Father Fitzmaurice was honored by the Pope with the title of Monsignor and the rank of Domestic Prelate. He died 27 February, 1906." In Mahony's Historical Sketches, published near the end of the last century, we find this reference to conditions existing then, when St. Michael's was in its heyday: "The parish has now a fine school building and a sufficient number of competent teachers for its children. Numerous vocations to the religious state mark the history of the Church of the Kensington district. Many of the boys have joined the Christian Brothers in the noble work of education. Many of the girls donned the sister's habit in one or other of our teaching communities. Some of the best-known priests of the diocese were baptized and educated here, among them Fathers McLoughlin, Coyle, McCort (now Bishop of Altoona), McDevitt (now Bishop of Harrisburg), Eicock, still living, and many others who are dead. Several Catholic societies, both literary and beneficial, are established and nourish in the parish, the Temperance Society alone embracing old and young of both sexes to the number of 1,800. The boundaries of the parish have often been changed, sections being taken off at the north and south to form new congregations. Many of the old families also have either died out or moved to more modem parts of the City. But nevertheless the same crowds are seen at the church every Sunday, the same spirit of piety and generosity still continues. It looks as if God prospered the church here on account of its persecution for the faith." "Resolved, that in his death we have lost a kind and loving Pastor, whose humble piety, wise counsel, and genial kindness endeared him to all. "With grateful appreciation of his numerous noble qualities we hereby record our acknowledgment of them as a tribute to his memory, which we shall ever fondly cherish." Now we shall continue with an excerpt from the Souvenir Book of the 1920 parish campaign: "To St. Michael's, in its flush and strength of power, came the present pastor. Rev. Hugh Dugan. It was in the balmy month of June, 1906, that he took over the keys and began the gentlest and kindliest of reigns. He had come from Berwyn, where he had founded and established the parish of St. Monica's and had guided it through a successful term of nine years. The parishioners there no more wanted to lose him than had those of Conshohocken, where, as a curate under Father Kinahan of saintly memory, he spent twelve peaceful years after his ordination at St. Charles'. His coming to St. Michael's was welcomed with .sincere pleasure. "Following in the light of tradition, he conformed to the unwritten law that great and telling strides towards progress should be taken by all pastors of this historic church. His experienced eye noted the imperative need of repair in the basement, and, with the thoroughness of his kind, he had that excavated and lowered. The undertaking was perilous in the extreme, the upper church at one time during the work, resting on stilts. It was accomplished so successfully, however, that practically it was changed into a new structure. New pews and a new altar were installed, supplying the finishing touches." "Several other improvements were made. In the' upper church new pews were introduced, while the walls were frescoed and the Stations touched up. - The school had an annex built, and in all these buildings was placed a new heating plant. Over $120,000 was expended on this splendid achievement." "Because Father Dugan realizes the value of supervising the leisure hours of youth he had, in due time, constructed, at Second and Jefferson Streets, a club for boys (i.e., a new home for the Literary Institute) - a striking piece of architecture, brick with limestone trimmings. Within it is furnished: and equipped with everything that goes to make a perfect club house. It is ideal in appointments and in fulfilling its purpose. "Still the girls are not neglected. A special building has been provided for them, in which are given courses in domestic science, millinery, dressmaking, bookkeeping, and. other feminine pursuits which are very acceptable to the Alumnae. "Those that ultimately feed both sources, the children, are well taken care of by the good nuns. Since the opening of the first school in 1853 till recently there has been a steady advance in their numbers. At first the Christian Brothers taught the boys and the Sisters of St. Joseph, the girls. Now these Sisters have under their care 1000 children who rank high in scholarship and initiative. (The sisters were given complete charge of the school by Father Dugan a few months after this campaign). "Everything has advanced, it seemed, but the position of these religious women who are living under very annoying circumstances. Sixteen of them are cramped in incommodious, not to say unhygienic, quarters, and yet uncomplainingly are giving their services. To remedy this defect and rid itself of the only blot on its fair escutcheon, St. Michael's, in the spring of 1920, under the leadership of its pastor, conducted a financial campaign. In six weeks they accumulated $60,000. The amount is to be used for the purpose of building a new convent. "Although Father Dugan is facing the situation of a reduced parish, innumerable old families having moved away, still he is buoyed up by the quality of the stock remaining. It is the same stock that met and overcame trials, the same stock that has given to this Archdiocese many devoted priests and nuns." The convenience of the sisters was the paramount consideration in the determination to erect a new convent, but account had also been taken of the fact that their present abode, so close to the school, prevented many of the classrooms from receiving sufficient daylight and that its site was needed as a playground for the children. Before entering upon the drive for the funds necessary in the new project, the pastor had already purchased the ground, upon which were four dilapidated houses - 1434 and 1436 N. Second Street, an eyesore directly opposite the church, and in the rear of these, 1433 and 1435 N. Philip Street - for the sum of $9,250.00. The building was completed in the summer of 1923 and was blessed by Father Dugan himself on Sunday, August 26, 1923. It stands today, a bright and comfortable home for the self-sacrificing nuns, and a beautiful monument of the zeal of one of St. Michael's line of illustrious pastors. When Father Dugan died, July 6, 1924, the parochial properties were in excellent condition, all debts had been paid, and there was money in the treasury. Rev. James J. Wilson took the examination for the permanent rectorship and received the appointment from His Eminence, D. Cardinal Dougherty. The ten years of his incumbency were undistinguished by any event of special significance. He was a kindly, pious man, extremely nervous, and subject lately to attacks of vertigo. No doubt the state of his health and the financial panic, euphemistically called The Depression, through which the country has been fighting its way for the past four or five years with at last a sound hope of a return to normal conditions in the near future, and which has severely affected the parish as well as every other group of the kind, prevented him from carrying out plans he conceived and occasionally discussed. He had always been interested particularly in the welfare of boys, and while rector at St. Ann's, Phoenixville, had purchased a tract of land in the Welsh mountains nearby and formed a camp for their training and recreation; the children of St. Michael's profited by this hobby of his, for many of them spent happy weeks every summer at Camp Glenmar, some belonging to poor families being sent there at his personal expense. With the approval of the lay trustees money of the Corporation was invested in this estate, and it is now entirely the property of the parish as Father Wilson's will so devised his share of ownership. The only formal meeting of the Board of his administration was held in May, 1928, for the purpose of taking action on an offer of $8,000 for a house left to the church in the will of Michael Corr; two other premises included in the devise had been sold in 1903. Death came to Father Wilson February 15 of this year, 1934; his remains rest in the priests' vault of the old graveyard that he had loved and kept in very good condition, along with those of Father Sheridan, Doctor O'Connor, Monsignor Fitzmaurice, and Father Dugan. A few years ago, while a curate at St. Michael's, I wrote that the parish "is certainly not what it was some fifteen or twenty years ago. So many of the parishioners have departed within this time for the new residential sections that their going might well be called an exodus. But there has been no decline .in activity; if anything, it has waxed more intense." This reference was to the spiritual and social life of the parish. It is inconceivable to one who has lived there for any period and entered into its interests that the time should come when its peculiar spirit of devotion would flag. The Holy Name Society, League of the Sacred Heart, Married People's Sodality, Single People's Sodality, Altar Society, have lost nothing of their vitality. The St. Vincent de Paul Society has been more active lately than ever before, not that there has been widespread want among the parishioners, but that many poverty-stricken families from other sections, having suffered eviction after eviction, have at length drifted within St. Michael's boundaries. Bequests have been made from time to time for such charitable work, and the fund is constantly added to by the offerings placed in the poorboxes. The Total Abstinence Societies, however, were permitted to fall into a state of neglect with the advent of Prohibition, for here as well as everywhere else that curious fiction of a dry America was publicly respected; efforts to revive them have not so far met with much success. The Alumnae and Literary Institute carry on as enthusiastically as ever. In regard to the lessening of numerical strength, it is to be remarked that the neighborhood continues predominantly Catholic, for there has been a great influx of Hungarians of the Faith, who have their own parish of the Sacred Heart, founded in 1913, with a church and school at Mascher and Master Streets. Over in old Fishtown where once a Catholic would scarcely venture to show himself, flourishes the Holy Name Parish, founded in 1904, the last to take territory from St. Michael's. There is much therefore to give encouragement to Father McGinnis, but he is confronted with a very difficult task. Many repairs and alterations are required in the parochial buildings and yet the revenue is barely sufficient to meet current expenses. He has already tackled the problem with the energy that has characterized him all through his priesthood. "The Rev. Patrick H. McGinnis was born February 11, 1875, in Newtownhamilton parish. County Armagh, Ireland. His mother dying when he was a small boy, he was brought to this country by an uncle, the late Rev. Hugh Garvey who was then pastor at Summit Hill, Pa. After attending the primary grades in public school until his thirteenth year, he entered Mt. St. Mary's College, Emmitsburg, Md., where he finished his classical course. His theological course was made at St. Charles' Seminary, Overbrook, where he was ordained by Archbishop Ryan on June 9, 1900. "His first appointment was to All Saints' Chapel, Blockley, where he served for two years under the late Rev. Eugene McElhone. On September 27, 1902, he was named assistant rector of St John the Baptist Church, Manayunk, where he has labored for the last twenty-three years. Father McGinnis is spiritual director of many societies in the parish which have prospered under his direction, notably the Rosary Confraternity and the Sodality of the Living Rosary, which has increased in membership from 200 to more than 2,000. For the last fifteen years he has been spiritual director of the ladies' T. A. B. Society, Sodality of the B. V. M., Junior and Senior Holy Name Societies. The latter societies are among the largest in the diocese, having a membership of over 1800. He has lately organized an athletic association to foster sports among the Holy Name members. The members of all the societies of which he is spiritual director will receive Holy Communion on Sunday for his intention. "He has always had an active interest in movements for the benefit of Ireland. When the United Irish League started in this country, a branch was established in St. John's called the 'Father Brehony Branch', of which he was president and through which large sums were raised for the Irish cause. He was also interested in the 'Michael Collins Branch' of the Friends of Irish Freedom. "During the trying times when the parish was struggling to erect a hall for the young people, he gave great assistance to the aged pastor, the late Father Brehony, and to Father Murphy, then an assistant who had charge of the work. "The Rev. Dr. Godfrey, in his sermon at the jubilee Mass, declared that the priesthood was instituted for the people and, hence, it was fitting that the jubilarian should observe his anniversary in God's service surrounded by those among whom he had labored during his ministry and in a public manner. He spoke of the special virtues which Father McGinnis had exhibited during his life, especially his devotion to the sick and needy, and his genius for organizing and directing, as shown in his relationship with the various parish societies. He closed his eloquent and touching sermon with St. Alphonsus' prayer for priests. "The chalice which Father McGinnis used at the Mass is one which is surrounded by many sacred memories. It was given to his uncle, the late Rev. Hugh Garvey, for his silver jubilee, December 21, 1887, by his brother Monsignor P. J. Garvey. Upon the death of Father Garvey, it was used by Monsignor Garvey until his death, and then by a nephew, the late Rev. Hugh P. Garvey, who died in 1918 when Father McGinnis obtained it. "Many messages' of congratulations were received by the jubilarian, but the one most prized was a cable from Rome delivered just as the Mass began. It was signed by Cardinal Gasparri and transmitted the Holy Father's special benediction. Fathers Veralli and Orlando cabled felicitations from Naples. "In the evening a reception was tendered him by the parishioners, at which there were many speakers. It was at this banquet and reception that Monsignor Murphy presented Father McGinnis with a gift donated by the members of the parish." After serving twenty-five years in St. John the Baptist's, on September 28, 1927, Father McGinnis was named rector of the Church of the Immaculate Heart of Mary, Chester, where he remained for six and a half years. On March 8, 1934, he was appointed irremovable rector of St. Michael's. Father McGinnis' both parents' families have given very many members to the priesthood and the religious life. While some have passed away, many are still living in different parts of the country. Two uncles were priests in this Archdiocese, the late Rev. Hugh Garvey, who died at St. Mark's Church, Bristol, and the late Rt. Rev. Monsignor P. J. Garvey, D.D., Prot. Ap., who died as rector of St. Charles' Seminary, Overbrook. Another uncle was the late Rev. Peter Garvey, rector of St. John's Church, Johnstown. On his father's side he was related to the late Cardinal Parley of New York, the late Rev. John Loughran of Minooka, Pa., and the late Rev. Arthur McGinnis of Danville, Pa.
Four of his half-sisters have entered religious communities, two in Ireland and two in this country. The latter, Sister Anna, is at the Sisters of Charity Hospital, Buffalo, N. Y., and Sister Aloysia at the Convent of the Little Sisters of the Assumption, New York City. The lay trustees of the last seventy years whose names are not included in the list of the previous chapter are: William Smith, Dominick Murphy, Thomas Kein, John A. Clark, John J. Byrnes, James Develin, John B. Smith, James J. Tully, Sr., John Keenan, Mark Develin, James McNamee, Thomas Mallon, William McGurk, Francis O'Neill, James P. Duffy, James P. Mallon, Edward Collins, John McKeever, John Farren, Thomas McTear, James J. Tully, Jr., Andrew Quinn. The last three are serving now and there are three vacancies; Mr. McTear was appointed in 1919, and has been a leader in nearly every movement in the parish since; the other two became members of the Board in 1928. The news has just been given to me that Rev. George J. Mullan is transferred to the Church of St. Francis Xavier, and his place at St. Michael's is to be taken by the Rev. Joseph L. Curran. "Rev. Thomas Kieran was born in the town of Armagh, Ireland, May 25, 1828. Having solidly laid the foundation of a good English education, he entered St. Patrick's Seminary in his native city on May 18, 1846, where he at once began his classical studies. It was more than four years later, namely, in the autumn of 1850, that he came to the United States with his parents and the rest of their children. The family settled at once in Philadelphia; and here, on January 25, 1851, he was admitted to St. Charles' Seminary in this city, the old building at the northeast comer of Eighteenth and Race Streets. Having successfully passed through the prescribed course of studies here, he was elevated to the dignity of the priesthood on October 30, 1854, by Bishop Bayley, of Newark, afterwards Archbishop of Baltimore, the Bishop of Philadelphia, Rt. Rev. John N. Neumann, C.SS.R., being then absent in Rome on his first visit ad limina. "On the day following that of his ordination Father Kieran was appointed assistant at St. Anne's, Port Richmond, where Rev. Hugh McLaughlin was pastor, and where the priests officiated and the people worshipped in the temporary church whose walls were torn down only a few months ago, the foundations of the magnificent new church not having been laid until many years later. In January, 1861, he was appointed pastor of St. John's, Manayunk, in succession to Rev. David Mulholland, who had resigned; but as Father Mulholland withdrew his resignation, though in very feeble health. Father Kieran's appointment did not take effect, and he was assigned to St. Michael's, to take the place of the pastor Rev. William Loughran, who on account of his impaired state of health, obtained leave to visit Ireland, where he died. The pastor of St. Anne's, named above, having died in September, 1864, Father Kieran was commissioned to take charge of that important parish. "Once permanently established in St. Anne's Parish, Father Kieran set himself immediately to his great undertaking. A new church had to be built, and he wisely determined to have one that would stand for ages as a monument of his own and his people's zeal. The result is to be seen in the magnificent brown stone temple that will survive many a successor to him in the pastorate. ... On Christmas Day, 1869, the new church was opened for divine service. Father Kieran also supplied his parish with a convent of the Sisters of St. Joseph, and parish schools, both of which have been greatly enlarged within the past few years. "For the last twenty years of his life Father Kieran has. Been pastor of St. Anne's, where he spent the first six of his priesthood as assistant. .... After a long illness, extending over at least three years, he surrendered his noble soul into the hands of his Creator at about half-past seven o'clock on Saturday morning last. May 10 (1884)." "The Diocese has sustained the great loss foreshadowed in our last issue, in which we announced that Very Rev. Vicar General Walsh, at the time of our going to press early on Tuesday morning, had passed beyond all human hope of recovery. For two days more he clung tenaciously to life, and passed to his eternal reward at ten minutes before three o'clock on Thursday morning (November 22, 1888), surrounded by relatives and members of his household. "Father Walsh was born in the vicinity of Dungarvan, County of Waterford, Ireland, on January 30, 1832, so that he had not yet reached the age of fifty-seven years when he was summoned to his reward. At a very early age he was sent to school to the Dungarvan Academy, where he made a very successful course of studies. Having completed his classical education in that institution, and having long had the intention of entering the priesthood, he was adopted for the purpose by Bishop Kenrick, of Philadelphia, just before that prelate was transferred to the Archiepiscopal See of Baltimore, and in May, 1851, came to this city, in which he was to spend by far the greater part of the remainder of his earthly life. On June 2, he entered the Seminary of St. Charles Borromeo, at Eighteenth and Race Streets, where he completed his philosophical studies and followed with marked success the prescribed course of theology, laying broad and deep the foundations of the sacred sciences. After spending four years in the Seminary he was ordained by Bishop Neumann. On July 2, 1855, he received Minor Orders, Subdeaconship on the 5th, Deaconship on the 6th, and was elevated to the sublime dignity of the Priesthood on the 8th day of the same month, when he was as yet but a little over twenty-three years of age. He was ordained in St. Michael's Church in this City, where he was afterwards to spend so many years of his useful ministry as a zealous and indefatigable pastor. "His first mission was at St. Patrick's Church, Pottsville, as assistant to the Rev. Father O'Keefe, long since deceased. He was only there five months when he was thought worthy to be entrusted with the important charge of the faithful of Tamaqua and surrounding towns, a charge which he undertook on the 16th of January, 1856. ‘He at once commenced the erection of St. Jerome's Church, Tamaqua, a beautiful Gothic structure, the most beautiful, in fact, in the whole extent of the coal regions. While there he also built St. Raphael's Church in Tuscarora, and purchased lots for the present church in Mahanoy City. The large district embraced within, the territory then under his jurisdiction, is now divided into several parishes, each having its own pastor. So that his labors might be the more effectual among the people there, he studied and mastered the Irish language, which was the only tongue many of his people, who had come from the mountain regions of Donegal County, Ireland, could speak. The rapid progress since effected there was amply foreshadowed during his comparatively short stay of a little over five years, for the improvements effected during that period were really wonderful. Nor did the laborer fail to be rewarded for his work, for on the 4th of June, 1861, at the early age of twenty-nine, he was appointed by Bishop Wood rector of the Diocesan Seminary of St. Charles Borromeo, an office of great responsibility, but one, however, whose duties he performed with distinguished ability until the 1st of October, 1864, on which day he was appointed Pastor of St. Michael's, then the most important parish in the City. 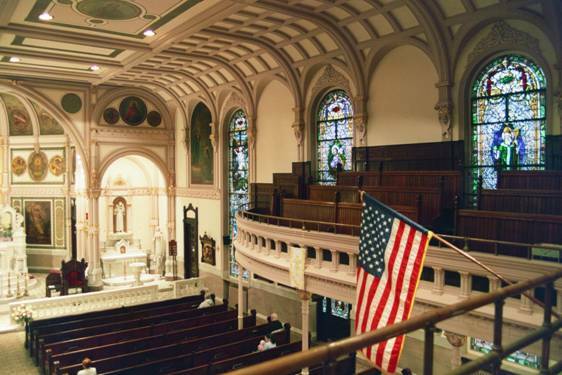 "For more than one reason St. Michael's is one of the historic churches of Philadelphia. Eleven years after its foundation it was raised from the ashes under which fanatical incendiaries had buried it on the memorable eighth of May, 1844; but it rose still shackled with the red-tape fetters of the pernicious trustee system. On this account it required a man of no ordinary ability to conduct its affairs with safety. That was why Father Walsh was selected to succeed Father Thomas Kieran, who, after spending three years there, had been placed in charge of St. Anne's, Port Richmond, in succession to the founder of that magnificent temple, the greatly revered Father McLaughlin. Father Walsh at once grappled with the difficulties which he knew he had to contend against. The church was then by no means a model place of worship. Improvements were immediately begun. Having been enlarged, it was also completely renovated. A new marble altar was procured, stained glass windows were put in, and the two towers erected, in one of which was placed a sweetly-toned bell weighing three thousand pounds, and in the other a fine clock. These improvements made the church one of the handsomest in the city. "As a suitable crowning of the pastor's labors, the sacred edifice was solemnly consecrated by the Rt. Rev. Bishop Wood on Sunday, the 30th day of September, 1866. Nor did the improvements in St. Michael's Parish end here. The pastoral residence was thoroughly repaired, an academy for the use of the Sisters of St. Joseph, now the residence of the Christian Brothers, which is situated on Second Street almost opposite the church, was purchased, and the magnificent convent connected with the parochial schools erected at a cost of nearly thirty thousand dollars. "For his successful labors in the cause of religion, Father Walsh was soon rewarded by being appointed on October 26, 1868, junior Vicar-General of the Diocese, when he was yet only thirty-six years of age. So well fitted for this responsible position did he prove himself that his duties seemed to rest but lightly on his shoulders, even when the death of the Very Rev. Father Carter left him to exercise them alone. "Under his mild, paternal care St. Michael's Parish was soon raised almost to the very highest point of prosperity; nor need there be any fear that it will soon forfeit this noble honor. But it is the happy fate of the priest of God that when he has accomplished his mission in one field, another is opened to him. Nine years ago St. Paul's Church lost by death its founder and first pastor. Rev. P. F. Sheridan, who might well be styled one of the fathers of the church of this diocese. He had accomplished a magnificent work, and it was but meet that this fact should be acknowledged by the continuance of that work being entrusted into the most competent hands. This was what the Most Reverend Archbishop Wood did when, after pronouncing Father Sheridan's funeral oration on the 12th of July, 1879, he announced his successor to be the Very Rev. M. A. Walsh, V.G. What greater compliment could His Grace confer on the people of St. Paul's than give them his Vicar General for a pastor, and what better return could he make to them for the heavy loss they had sustained? The improvements effected within less than a year after his appointment soon showed the wisdom of his choice. The most apparent of these is the new pastoral residence, the finest in the city, which has taken the place of the old one erected when the parish was in its infancy. "Higher honor and responsibility was yet awaiting Father Walsh. On June 20, 1883, the Diocese lost its first archbishop, who on the day preceding that of his death appointed his Vicar General to administer the affairs of the Diocese until his successor would be installed. The event showed that the great confidence thus reposed on Father Walsh was not misplaced; for during the following year and over that he exercised this authority he gave the utmost satisfaction to all concerned, and surrendered his charge to Archbishop Ryan in at least as good condition as he had received it. He was given a signal honor in the early part of his administration, when, on August 6, 1883, the faculty of Mt. St. Mary's College, Emmitsburg, Md., conferred on him the degree of LL.D., a delegation from the faculty waiting on him at his house for that purpose. Towards the end of the same period during which he was administrator, he was attacked by his first serious illness in May, 1884, he was stricken down with inflammatory rheumatism, which at one time brought him to the point of death, and from which he did not fully recover until the following November. From that time he seemed to enjoy very good health until attacked by his last illness. It was during his former period of ill health that his long term of administratorship ceased; and in recognition of the fidelity with which he had performed its duties. Archbishop Ryan on the very day of his installation, August 20, 1884, reappointed him Vicar-General, which office he held until his death. Once more he was for a brief period made Administrator of the Archdiocese, namely, last winter, during Archbishop Ryan's absence on his first official visit to Rome; and then again he showed his entire fitness to discharge in the most acceptable manner all the duties of the high office. We may, therefore, well hope that when called to give an account of his stewardship, he has received the reward of the good and faithful servant." "A great bereavement has been suffered by St. Michael's Parish by the death of its self-sacrificing pastor. Rev. Dr. O'Connor, whose loss will be deeply mourned not only by the people of whom he had immediate charge, but by all everywhere who had the pleasure of knowing him, whether they be priests or lay people. "Though he had not been in good health for two or three years past, yet he was able to attend to the duties of his pastorate until a very short time before his death. He conducted the May devotions every evening during the past month until Thursday of last week. On returning to his room after the services of that evening, he was well enough to attend to the financial affairs of his charge. This duty he had just completed when, about nine o'clock, he was suddenly seized with a severe attack of the trouble from which he had long been suffering, a most insidious form of heart disease. Becoming no better, word of .his condition was sent on Saturday to some of his most intimate friends among the clergy. On Sunday morning he felt so poorly that it was thought well to administer the last sacraments, and this sad duty was performed by his first assistant Rev. Patrick J. Tierney, in presence of the other assistants and a few friends besides. He lingered until about a quarter past three in the afternoon, when he passed away quietly and painlessly sitting in his chair, where only a few minutes before he had chatted pleasantly with those around him. Among the friends present during his last agony were Rev. Richard Kinahan, Pastor of Conshohocken; Rev. John W. Shanahan, Pastor of the Church of Our Mother of Sorrows, formerly an assistant at St. Michael's; the present assistants at this church, and the members of the community of Sisters of St. Joseph having charge of the parochial school for girls. "Rev. Charles P. O'Connor, D.D., was born at Fourth and Spruce Streets, in St. Mary's Parish, Philadelphia, on June 29, 1840, and received his earliest education in his native city. Removing to Wilmington, Del., he became a pupil of Mr. E. B. Hickey, a well known teacher, who was a professor in St. Mary's College in that city, and from his care he passed in 1859 to the Preparatory Seminary of the Diocese of Philadelphia at Glen Riddle, where now is the motherhouse of the Sisters of St. Francis. Here he showed such aptitude for classical and ecclesiastical studies that in the following year he was chosen as one of those whom it might be well worth while to send to Rome to complete their course. One of the very few who accompanied him on that occasion was the present Chancellor of the Archdiocese, Rev. Ignatius F. Horstmann, D.D. Completing the prescribed curriculum in the Eternal City, he was ordained there on September 8, 1866. His superior taste for and application to sacred studies received early appreciation, for even before his ordination he was assigned to the duty of teaching. He was appointed Procurator of the American College, Rome, on account of his business tact, and became its Vice-Rector when, in the spring of 1868, the Rt, Rev, Dr. John McCloskey was made Bishop of Louisville, Ky., thus vacating the rectorship of that institution, and in this capacity Dr. O'Connor served until 1871, when he returned to Philadelphia. After, being engaged for about six months in missionary work here, first at the Cathedral, and later at St. Michael's, he was again assigned to the duty of training young men for the priesthood, joining the staff of professors in St. Charles' Seminary at Overbrook as its Vice-Rector. "On the resignation from the rectorship of that institution of the present Bishop of Omaha, Nebraska, Rt. Rev. James O'Connor, D.D., he was promoted to that place, which he filled with marked ability for seven years, the institution in every respect flourishing under his management, and showing him to be a worthy successor of the namesake whose work he continued. His health, and particularly his eyesight, becoming impaired in 1875, he made a pilgrimage to Lourdes in the summer of that year, when he also visited the Eternal City. At the suggestion of Archbishop Wood, who fully appreciated his services as Rector of the Seminary, the Holy Father conferred on him the title of Doctor of Divinity, to which he long had a claim on account of his superior learning. He retained charge of the Seminary until the summer of 1879, when he was made Pastor of St. Michael's Church in the Kensington section of Philadelphia, in succession to the Very Rev. M. A. Walsh, V.G., who had taken the place made vacant at St. Paul's by the death of the founder of this parish. Rev. Father Sheridan. "Dr. O'Connor entered at once most actively on the duties of his new position. In a short time he devised means to pay off a large debt that remained on the church property until then, and to improve the pastoral residence, to which he added a story, covering it with a mansard roof. He also made needed changes in the arrangement of the parochial school. But his greatest undertaking was the remodeling, or rather reconstructing, of the church itself, which he began over two years ago, and which by his ill health since then and his death he leaves to his successor to finish. Only the work on the exterior has been completed. For the purpose of enabling him to continue the work, a fair was recently opened, for he had wisely determined to have nothing done unless there was money forthcoming to pay for it. "In addition to the qualities of his character and the labors of the pastorate which we have noted, he was indefatigable in preaching. He would himself deliver all the Advent and Lenten discourses, and those during the Forty Hours' Adoration. Enduring evidence of his ability in this direction he has left behind him in the shape of pamphlets containing courses of his sermons which he had published for the benefit of the St. Vincent de Paul's Conference of his parish." "Rt. Rev. James J. Fitzmaurice, irremovable rector of St. Michael's Church, Second and Jefferson Streets, died at Galen Hall, Atlantic City, N. J., on Tuesday, February 27, at 10.30 P. M. Monsignor Fitzmaurice had been seriously ill for some weeks, and for several days hope for his recovery had been abandoned. The last blessing was given by Rt. Rev. Bishop Prendergast, between whom and the deceased there had long existed a bond of closest intimacy and devotion, the last sacraments having been previously administered by Rev. Francis J. McShane, O.S.A., rector of St. Nicholas Church, Atlantic City. Several times during his illness Msgr. Fitzmaurice was consoled by the presence of the Most Reverend Archbishop. "At Msgr. Fitzmaurice's bedside when he passed away were Rt. Rev. John E. Fitzmaurice, D.D., Bishop of Erie, and Rev. Francis P. Fitzmaurice, rector of St. Joachim's, brothers of the deceased; Rev. Francis J.Clark of St. Malachy's and Edmund Fitzmaurice, D.D., of the Annunciation, his nephews; Rev. Daniel O'Connor of St. Agatha's, his cousin, and Revs. M. J. Crane of St. Francis de Sales and James J. Cartin of St. Michael's. "The remains, accompanied by Bishop Fitzmaurice and the priests named above, were brought to this city on Wednesday, arriving at North Philadelphia Station at 11.12 A. M., where they were met by Bishop Prendergast, Monsignors Turner and Loughlin, Rev. N. J. McManus of Scranton, a large number of local priests, Christian brothers from St. Michael's School, and a delegation of male parishioners. The clergy, in carriages, accompanied the remains to St. Michael's Rectory, arriving at noon. A crowd, composed mainly of sorrowing parishioners, school children and Sisters of St. Joseph attached to the school, had assembled, and the church bell tolled. "Rt. Rev. Msgr. James J. Fitzmaurice was one of the most universally esteemed and beloved priests in the diocese. An object of the deepest devotion and affection on the part of his people, and looked upon by the clergy of every grade as a type of the pious, zealous and modest priest, and faithful, far-seeing pastor, and by all who came in contact with him as a model gentleman. "Msgr. Fitzmaurice was a native of Tarbet on the banks of the Shannon, in County Kerry, Ireland. Of a family famous in its several branches for long-lived and devoted priests, he early gave evidence of a vocation, and coming to this country, entered the Seminary at Eighteenth and Race Streets. He served for a short time as professor in the preparatory seminary at Glen Riddle, and was ordained to the priesthood on May 10, 1866, in the Cathedral, Bishop Wood officiating. In the same month he was appointed assistant at the Church of St. John the Evangelist, and remained there six years, until May, 1872, when he was sent to St. Agatha's as rector pro tem. In November, 1872, he was appointed rector of St. Agnes', West Chester, remaining there until February, 1874, when he was given charge of the Church of the Immaculate Conception, Allentown. In November, 1876, he became rector of the Church of the Sacred Heart, this city, and labored there for nearly eleven years. During his pastorate the present church edifice was completed and a new rectory built. "In August, 1887, he was named as irremovable rector of Old St. Michael's, the examination that preceded the appointment being the first of the kind held in this diocese. "Father Fitzmaurice's years at St. Michael's were full of fruitful labor. An up-to-date school was erected, furnishing accommodations for nearly 1,000 pupils; the substantial rectory built, the spacious church made practically new inside and out, and the interior of the convent reconstructed. The parish is thoroughly organized, all the societies being vigorous and progressive, and the section in which the church is located thrives as one of the old strongholds of the Faith in the City of Brotherly Love. "The Rector of St. Michael's was one of the diocesan consultors and a member of the Board of Synodal examiners. "In July last he was appointed a domestic prelate by His Holiness Pope Pius X, an honor which gave widespread satisfaction, though received by Father Fitzmaurice with the modesty which characterized him." "The Rev. Hugh J. Dugan, P.P., of St. Michael's historic church, died in St. Joseph's Hospital, fortified by the last rites of the church, at 11.30 P. M. on Sunday. Father Dugan had been ill for some weeks previous to his entry in the hospital twelve weeks ago. His death, was peaceful and edifying. "For eighteen years and a half the late priest had guided the destinies of St. Michael's parish, and in addition to supplying needed renovations, he had undertaken many real Catholic welfare works for the poor of the parish. He held the diocesan office of parish priest consultor. "Father Dugan was born in Minersville on February 28, 1861, where he obtained his early education. He entered the diocesan seminary at Overbrook where he studied the humanities and the usual philosophical and theological subjects. He was ordained in the Cathedral on January 11, 1885, by Archbishop Ryan. "The young priest's first mission was as assistant rector of St. Matthew's Church, Conshohocken, where he became associated with the famous educator, the late Rev. Richard Kinahan, then pastor, of St. Matthew's. He remained in his curacy at Conshohocken from 1885 until January 10, 1897, when he was appointed first rector and founder of St. Monica's Parish, Berwyn. After an ambitious building programme had been completed at Berwyn by Father Dugan, he was called June 13, 1906, to the rectorship of St. Michael's, one of the oldest and most historic edifices in the City." (The remainder of this obituary has already been given in the excerpt from the Souvenir Book of the 1920 Campaign). "Rev. James J. Wilson, rector of St. Michael's Church, Second and Jefferson Streets, died of pneumonia at noon yesterday (Thursday) in St. Joseph's Hospital. He was fifty-nine years of age. "Present at his bedside when he died were Revs. George J. Mullan, Peter A. Daley, Raymond J. O'Donnell and Sisters of Charity. Father Wilson had been in ill health, about two months and was admitted to the hospital a month ago. "He was born in this city on October 18, 1874, and was ordained on January 9, 1900, in St. Charles' Seminary, Overbrook, by the late Most Rev. Patrick J. Ryan, D.D. "His first appointment was as assistant rector of the Church of St. Vincent de Paul, Minersville, on June 20th of the same year. On June 14, 1902, he was transferred to Tower City, Church of SS. Peter & Paul. .
"Five years later, on December 14th, he was named rector of the Church of Our Lady of Perpetual Help, Morton, and in 1917, on June 13th, received the rectorship of St. Ann's Church, Phoenixville. "In 1918, on September 7th, he came to Philadelphia as assistant rector of the Church of the Holy Cross, and returned as rector to St. Ann's Church, Phoenixville, on October 15th, 1918. "It was on August 14th, 1924, he returned to this city as rector of St. Michael's Church."